I go for Abomey or Bohicon Benin; Bohicon is on the railway tracks and seems to be a junction, while Abomey is pushed by the LP - Lonely Planet West Africa as the place to go. I will go for the internet; I hope a two-day an out trip. 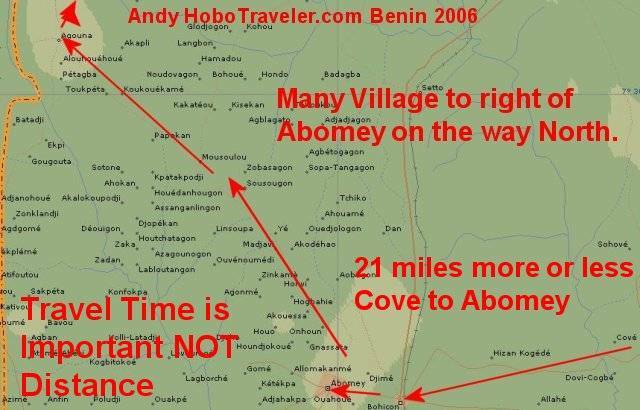 To the West of Abomey or Bohicon are many small villages. I want to go right up the middle of them. This map shows many villages to the left and north of Abomey, Benin. I want to see Africa; I am going to take for sure the road less traveled and go up the left side closer to Togo. It will make finding a city with a hotel more difficult, but not a problem, I can just keep trucking, literally trucking until I get somewhere. I will stay in Abomey, try to post this world and move on North and West or the left part of map. I guess there are arrows… hehehe; I cannot see the map as I type. I think what I am searching for is typical or real Benin, I like to see close to natural living as an Animal, and not as presumptuous, we are not Animals way of thinking. I want to know who I am, why I am, why do I think and behave as I do. It seems extremely relevant to find out how I would act if nobody told me how to act. What tells or who tells primitive people how to act? Everyone feel pressure, these are not stupid people, they are primitive people, and lack of knowledge does not preclude a very smart brain. I do think math is a question mark, but that is my joke. Ok, there is a man, a person, who lives on the earth, who has not been filtered, snapshot made, created to be, socialized by some religion, creed, nation to believe I am this. There is a self-sustaining village on the planet where people have nothing brought to them. I wish to go to this village or as close as possible. They call them uncontested tribes. The correct is probably little contact, the degree of contact. Want list decreases when there is no temptations, they first one in Maslows is food, then security and safety, then comes love. I am coming to believe at this stage of motivation after a family is established or love is found. The person’s stops or the major groups of individuals stop making any progress. Curiosity or the need to understand is up number SIX, if a group has more free time, less trying to sell time; I think they will become more curious. I tend now to think if I was in an extremely primitive society they would be higher on the stages, as they are not spending 90 percent of their day fighting for money to buy a cell phone. The food is easier, the safety is simple, the love is easy, and then comes attainment of self-esteem. This has a lot about being good at what you do and how other view you. In a smaller village, a group could or may be very accepting, they could be the opposite. Reading books on this is not fun, like reading music, nothing every seems clear, or interesting. However, after you play the music, it can be great. I like to play the music side of culture, looking at it, understanding by seeing or listening to the music of culture in action. All of life is culture, however after we leave the Stone Age it become a mixture of cultures, the USA is a totally mixture of many cultures, started being mostly Europe, now moving Mexico or Black.